The Apple iPhone 5 was only released on Friday and headlines were full of news of the launch and the huge numbers that were being sold. Many people are extremely pleased with their shiny new iPhones but as usual with any major product launch, a few days later some issues usually start coming to light. With the iPhone 5 there seem to be some concerns over poor build quality. Meet ‘Scuffgate’ or even ‘Scratchgate’ as the problem is already being referred to. On release day we posted an article about the first drop and durability tests on the iPhone 5 where it actually turned out to be much tougher than it looks. 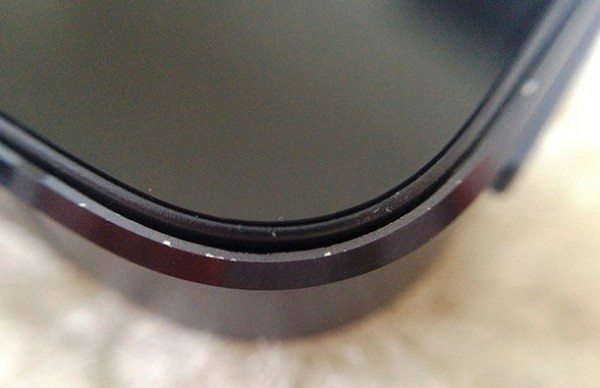 However in the same post we told about a report saying that the black iPhone 5 in particular seemed to be susceptible to scratches and scuffs after an image was posted by a website that had deliberately attempted to damage the anodized aluminum reverse of the iPhone 5. At the time we commented that although this did not look good for the new iPhone we imagined that if anybody was determined enough to mutilate a product they would be able to do so eventually. However it seems now that we may have to take back our initial thoughts on this, as it seems to be becoming a widespread issue and a real concern for iPhone 5 customers. These customers have not attempted to deliberately scratch or scuff their new phones either, but rather it seems as though many actually received them marked, straight out of the box! GSM Arena reports that plenty of new iPhone owners are claiming that their new black and slate colored iPhone had scratches and also dents along the edges when they took it out of the box. It has always been the case that anodized aluminum is pretty easy to scuff as the color is painted on top. Therefore a tiny scuff can reveal the silver color underneath. Thin edges in particular will also be susceptible to denting, as aluminum is such a soft metal. The problem is when the product is already damaged before the new owner has even had their hands on it as seems to be the case, with growing numbers of users reporting this problem. It seems that owners of the white and silver iPhone 5 are also noticing this issue but that maybe the marks aren’t quite so noticeable with this color option. This does suggest that Apple has pretty poor quality control checks in place at the moment and while it should be easy enough to get a replacement for any defective or damaged iPhone 5 received, it shouldn’t be the case that consumers have to sort this problem out in the first place. Another issue lies with those who intend to import the device to another country and this is where a statement from Apple would be welcomed. Although Apple has already issued a statement regarding criticism about its new iOS 6 Maps app, the company has yet to comment on the build quality concerns as far as we know. Forbes also reports on this problem and says that users say the damage was underneath the protective film used for packaging, suggesting the marks didn’t arise in transit but rather through carelessness on the factory floor or through a faulty production process. Other new iPhone 5 users also report that although their new phone was fine out of the box, it then picked up scuffs and scratches to the back and sides after only very light use. Another report, this time on AllThingsD tells how complaints are growing about this issue and you can see evidence of this at this MacForums link and also on this Apple customer support thread. One iPhone 5 user states that a customer service rep informed them that this was a “widespread issue” so it seems that a rep has acknowledged it, even if a wider company statement hasn’t yet been issued. Whereas once we had Antennagate the big issue for this iPhone 5 now appears to be Scuffgate or Scratchgate then. We’d really like to hear from our readers who already have the new iPhone. Is your phone fault-free or did you notice any damage on your iPhone 5 on unpacking it? Maybe it was fine at that point but has since received some damage after only light use? Let us know with your comments. Well? Anyone? Don’t be shy, it’s alright, it’s ok to admit that you were a bit disappointed with your new iPhone. Jobs Bless you! mine had a scuff on the back when i bought it. Same here. Took it back and they said “That shouldn’t have happened. Are you sure you didn’t scratch it on accident without knowing?” So now I’m stuck with it, but it’s not that noticeable anyways. yep- mine had a ding on the edge of it out the box. but i cant be bothered to take it back because of it. It will get battered at some point regardless. as its a phone, not a tank- Though i’m sure you could still key the hell out of a tank. Also feel free to take a look the closet competitor, the galaxy s3- that thing is made out of horrendous flimsy coated plastic, feels cheap, looks cheap. I’ll stick thanks. My wife and mother-in-law bought Galaxy S III’s. Yep. They are plastic. But you know what, they do not look or feel ‘cheap’. And I bet they won’t scuff or scratch as easy as the new iPhone 5. Just get your case and be happy. S3 looks cheap- plastic fantastic! Glass and aluminium versus plastic, it’s no comparison. Being delivered scratched is shoddy though, but at least every customer will get a new one. there is no point having a scratched farrari if its a lemon to begin with. Exactly. Have the SIII myself, and the plastic is far more durable than any glass ever will be! Had it since June, not a scratch on it! And, I’ve only JUST started using a case as my bag is small and doesn’t have a separate pocket for my keys. iPhone used to be innovators of design and technology. They should have stuck with what they were good at. iPods and Macs. Handled mine like a baby but all the corners are wearing off already. Will be looking for a refund. Galaxy SIII Here I come! Seems like substandard aluminum is used in iPhone 5. If iPhone 5 is a jewel, it sure is not a diamond. Scuff gate, Maps App fouls, what next? Display cracking? Bottom conector woes? Head set mayhem? Jobs is sorely missed. Apple quality is going down to the drain. That’s a nice dramatic close, Mika. What did you end your melodramatic posts with when Apple’s MobileMe didn’t work and Steve Jobs WAS around? Mine arrived on Friday with 2 chips on the aluminium band around the screen. Replacement arriving tomorrow. Does anyone know if the silver and white version is any better? Is the aluminium strip around the white version similar to the of the iphone 4S? I received my iPhone 5 on the 21st from Verizon per-order and it is in perfect condition. I must have been one of the lucky ones. I love the phone and it works fine and looks fine. But wasn’t it leaked that 10 out of 100 iPhones where confirmed to be in proper condition, so yes you were lucky. but the other 90 people are annoyed. Mine is clear of marks . But the software needs some fixing . I dropped it 500cm when it fell out of my pocket sitting down and the aluminium band on the bottom chipped off (about a dent). I was extremely disappointed with its ability to withstand the drop. I’m sure apple didn’t make it this delicate. wow drop from 5m and you were dissapointed? no scuffs, no marks, had it since 11am friday. TLC. TLC. Mine got a minor dent and couple of blemishes on the bottom back out of the box. Took it back to Apple store. Replacements also got defects/blemishes. Gone through three different ones and finally got one with just a midget of a scratch on top of the band. Staying with this minor blemish. White iPhone – Opened with the customer rep 8 boxes of new white iPhones until we found one with almost no scratches/dents on it. NO BUILD QUALITY WHAT SO EVER. Walked away after looking and holding an iphone 5 in an Apple store. Cheap looking and felt cheap, too. Seen an S3. Still second to iPhone. All bear in mind, iPhones miles ahead, you get free operating system upgrades for a long time, sure iPhone 5 has build quality issues, but hey even iPhone 3g buyers can upgrade to iOS 6 for free. That doesn’t happen with samsung. Add to that, apple miles ahead on quality of its products otherwise. Had the Lumia 920 for some time now.. Dropped it twice, still looks brand new.